In the Catholic faith, St. Monica is the patron saint of mothers and Catholic Community Services will soon be carrying out her work in Keizer. 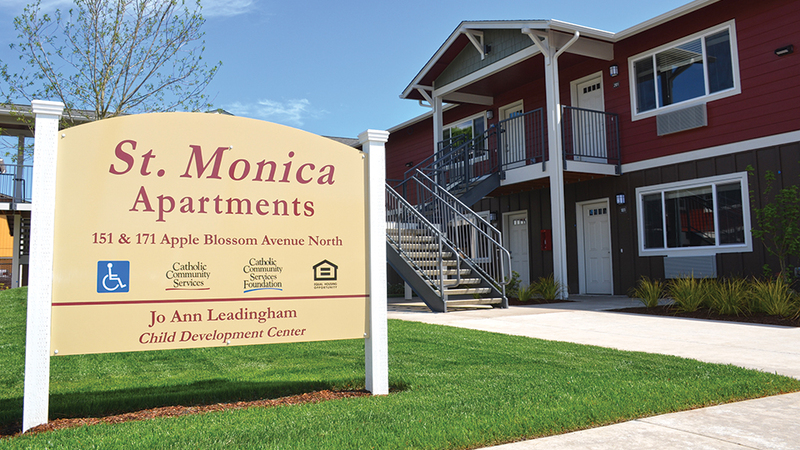 On Wednesday, May 14, from 4 to 6 p.m. the organization will celebrate the opening of the St. Monica Apartments at 151 Apple Blossom Avenue N.E. The apartments will serve young, pregnant women and young mothers who have outgrown foster care or have no other alternatives for housing. “We expect the building to be certified for occupancy this month and start receiving the first tenants on June 1,” said Jim Seymour, executive director of Catholic Community Services (CCS). Catholic Community Services took ownership of the Apple Blossom site when it assumed responsibility for a portfolio of local properties from the Salem-Keizer Community Development Corporation about four years ago. At the time, the apartments on the site were an eyesore. Half of the complex burned in a fire in 2013 and the other half wasn’t in much better shape. “There were roofs leaking and other issues, so we condemned it when we took ownership,” Seymour said. Around the same time, CCS was also rethinking how it administered legacy programs for unwed mothers, which were established by Rev. Charles Taaffe in 1975. Taaffe established two homes in Salem, St. Monica and St. Teresa, for unwed mothers. However, more than four decades of social change had also changed needs for young, pregnant women. “Through the St. Monica Home we served about 15 women a year, but we realized that most of the young women we were working with had opportunities to live with a relative or make their way back to their families with a little work and counseling,” Seymour said. The St. Monica Home was shuttered and the funding directed to community health workers that assisted the young mothers in new ways. CCS went from serving 15 women to 75 annually, 83 in 2017 alone. Through that work another need arose, there were pregnant women aging out of foster care accommodations – roughly between the ages of 19 and 22 – who needed a home of their own. CCS approached donors to the St. Monica program and raised more than $1.2 million to invest in a new apartment complex on the Apple Blossom site. A grant from Federal Housing and Urban Development and Home Investment Partnership Program assisted with the demolition of the aging apartments and CCS began construction on the new complex. In addition to a roof over their families’ heads, the tenants will also have access to an apartment manager who doubles as a mentor and life coach, a community health worker who will coordinate healthcare, housing and social services, and an on-site preschool supported by Community Action Agency’s Early Head Start services. The on-site school will be named after Jo Ann Leadingham. The total investment is about $2.2 million, Seymour said. St Edward Catholic Church is also helping furnish the apartments as part of a fund raiser benefit this weekend. “There have been many people who have stepped up and the city of Keizer and Mayor Cathy Clark have really supported this project from the start. The city staff have been wonderful to work with,” Seymour said.